How Can I Unwrinkle My Wedding Veil? When you receive your veil in the mail from Classic Veils, you will find it neatly folded in a clear bag. Unfortunately, there are bound to be a few wrinkles and creases from the folds. The first thing to do, of course, is to try on your new veil. 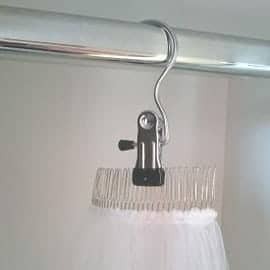 Once you are satisfied with how it looks, you can go ahead and hang it up in your closet using a bridal veil storage clip. The veil should hang freely and without touching the floor. Veils that are longer in length can be tricky to keep off the floor. Try to find the highest spot available from which to hang the veil. Wrinkles will naturally disappear over time. It may take a few days or more for the wrinkles to disappear. Should stubborn wrinkles persist, hang up the veil in the bathroom and use the time-tested ‘steam from the shower’ technique. 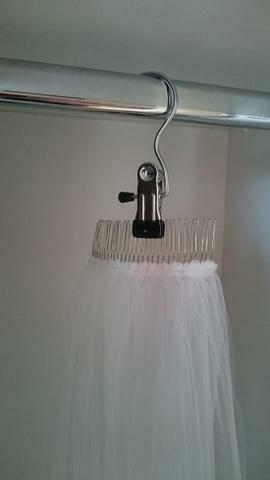 The steam from the hot shower will release the wrinkles without damaging the tulle. 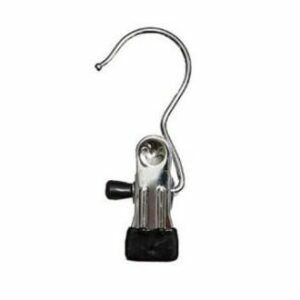 You could also use an at home steamer. Caution: Don’t let the fabric get too hot because the direct heat could melt the fabric! Finally, if you are not able to get rid of pesky wrinkles on your own you can always take it to a local dry cleaner and have it properly pressed. 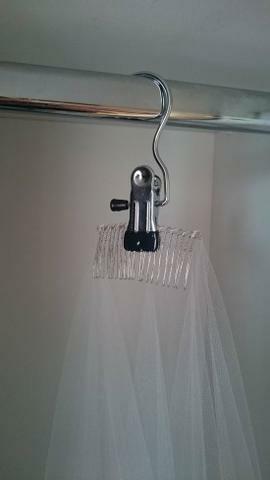 Once the wrinkles are removed, it is best to keep your veil hung up on a hanger until your wedding day arrives. You may also keep it in a plastic dry cleaning bag to help keep it clean and wrinkle free. For veils that have a gathering at the comb, clip the center of the metal comb with the teeth pointing up. For Mantillas or drop veils that have no gathering on the comb, you will want to clip the top of the comb and point the teeth down. The material will be able to hang freely in the same direction when worn. We hope this post has answered all your questions around those pesky wrinkles, so that you will be sure to have a smooth, wrinkle free bridal veil on your big day. If you have any questions about getting wrinkles out or anything else surrounding veils, please contact us! We are more than happy to help.